The Spring Boot command line application example walks you through the process of creating a non-web application example spring boot step by step. Spring Boot is sub-project developed by developers of spring framework, Spring Boot makes it easy to create stand-alone, production-grade Spring based applications with minimum configuration possible. A standard Maven project structure. We create a service to return a message. Foremost, we need to go to project directory in console, then package and run it using command line. 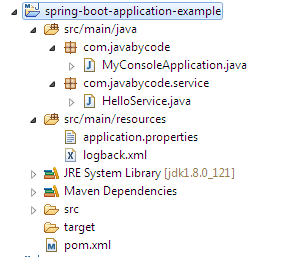 java -jar target/spring-boot-application-example-1.0.jar "Spring Boot Application"
That’s all on the Spring Boot command line application example.